To get your integration with Kumulos started quickly, Kumulos will have built you native libraries for your platforms during Step 4. We'll go over the steplets necessary to get these libraries working in your project below. 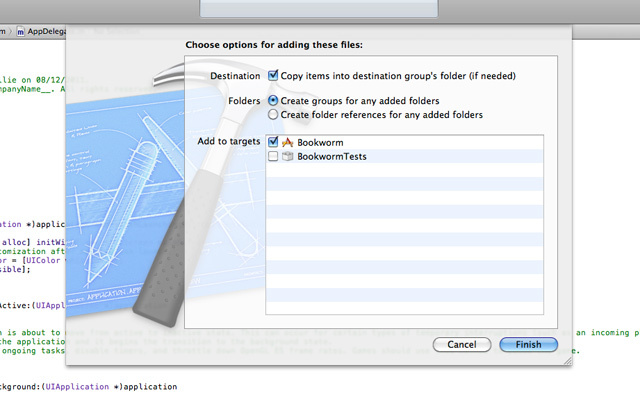 Click the large green button to start downloading a zip file containing your library files. 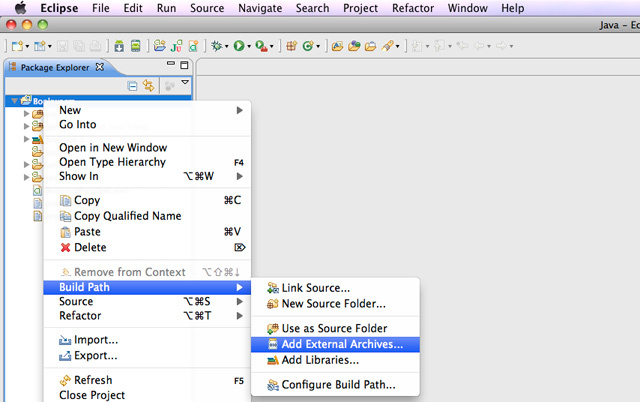 Your libraries will need to be added to your mobile app's project in your chosen IDE. These steps differ slightly depending on the tools you're using. 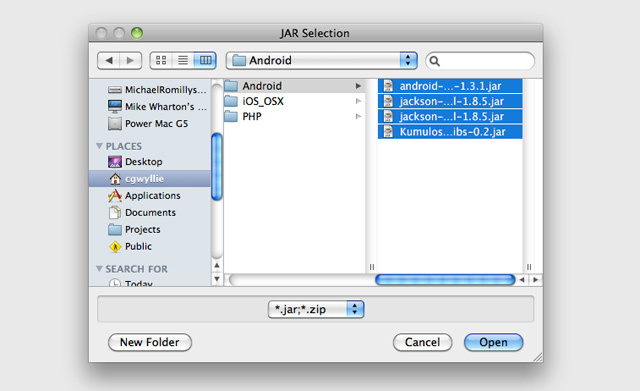 Here we'll show you how to add the libraries to Xcode for iOS/OSX, and Eclipse for Android. Once you've unzipped the bindings zip, choose which steps to follow below. 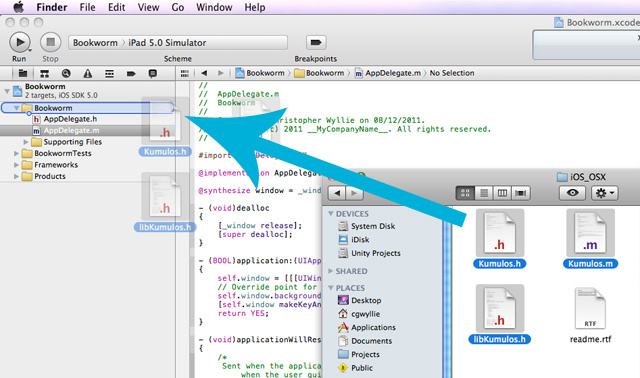 Drag and drop the Kumulos.h, Kumulos.m, and libKumulos.h files into your Xcode project. Now you've added the libraries to your project, you're ready to make calls to Kumulos from your mobile app! To see how to make use of the generated libraries in your target platform's language, check out the documentation below. You've successfully completed the Getting Started guide and have Kumulos running with your app. So... what's next? To continue developing your application, you'll most likely need to iterate Steps 2-5 to get things right. Whilst you iterate your development, you can test your app on up to 25 different devices. Once you've finished your development cycle and your app is ready to publish, you simply turn the app into production in Kumulos and enter your billing information. This will lift the development device limit and push your API to our optimised production servers. 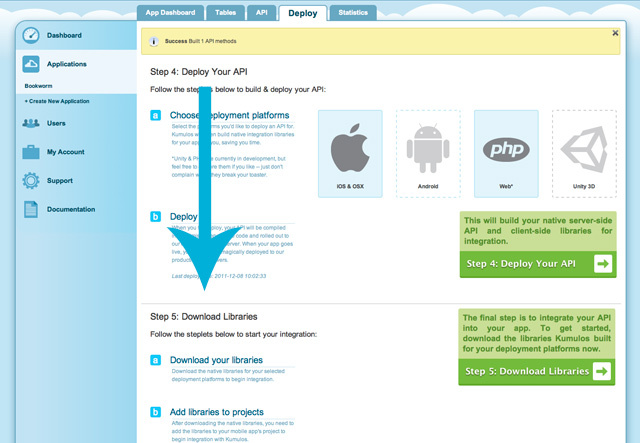 This is covered in more detail in our Launching Your App guide.